I started drafting this post a couple of weeks ago. There were a a couple of things about this assignment that bothered me, that I wanted to think through. In the last week there’s been a major twist, which I’ll get to at the end. The project topic is Cultural Fusion. How close is that to Cultural Appropriation? Given Australia’s history I try to be aware of damage already done by people from another culture sweeping in and taking over. I wouldn’t dream of using Australian aboriginal sources, as I think it has been made clear by members of the indigenous community that this would not be welcome. The Art history course had plenty of examples of the influences of other cultures – Japanese prints in the late nineteenth century, or African masks and Picasso’s Les Demoiselles d’Avignon. On the textile side, in around 1919 the Brooklyn Museum established a study room, for the specific purpose of allowing designers access to the ethnographic collection as a source of inspiration, and held an exhibition within the collection halls showing products and the museum objects which inspired them (see Whitley, 1998). More recently Margarete Ordon (2008) examined the way a clothing company “self-consciously markets the ways their products distort the textile designs, objects, and cultures of a colonized region that they also claim to celebrate and keep alive”. 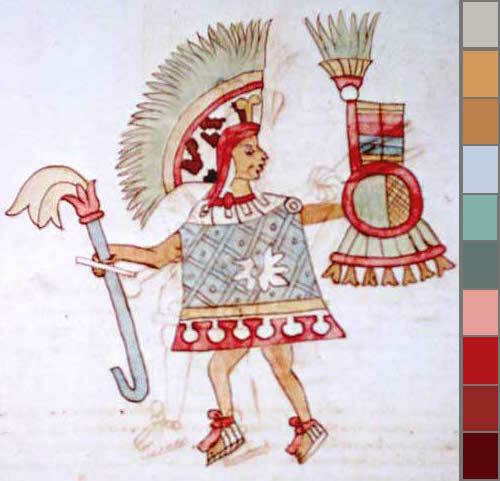 The Aztec themselves used images and ideas from earlier cultures for their own purposes, including as a source of authority and legitimacy (see discussion of the Emperors’ cloak, 17-Nov-2014). Even more relevant: “Whether through tribute, looting, or the collection of heirlooms, the Aztecs were the recipients of many works of art that they studied, cherished, buried again, or incorporated into their own visual imagery” (Miller, 1986, p. 210). Unfortunately I suspect it’s faulty logic to say that because something was OK in their culture it’s OK for me to do it to them. 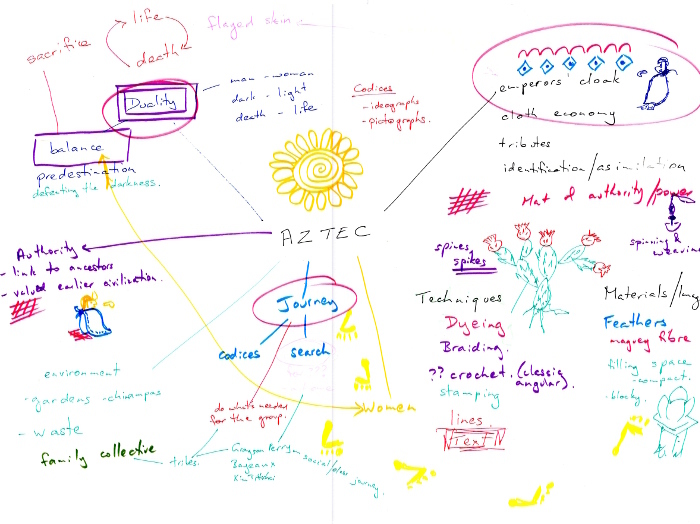 My tentative idea was to learn what I could of the Aztecs, and try to find connections to my present – perhaps see my world a little differently, or new parts of it. That feels more like fusion – being open to change oneself, rather than say taking a motif and producing it in different materials. I feel I’m splitting hairs, but I’m definitely uncomfortable and somehow I have to manage this. I’m sure the OCA website used to include use of colour forecasts in its high level list of degree outcomes. Happily it appears to have vanished. When re-checking my goals before re-enrolling, this most strongly made me hesitate. For this current project I might want to use colours taken from an image, such as the palette I’ve developed on the right. Or I might want to use colours important to the Aztec, such as turquoise, scorpion (a gray orange) and tawny, as explored clumsily in my sketchbook (18-Nov), or colours suggested by emotions – or almost anything other than what some stranger thinks is going to be exciting in New York fashion week spring 2015. I work very slowly. I make a reasonable living in a quite different field, which allows me to indulge myself in my passion. I have no desire to make or design products for market. Which is a requirement for a part of this project. From recent discussion on the OCA student forum I now accept that for others fashion colours and market trends are not just a necessity but really interesting. It’s just not for me. One of the advantages of doing a course is being taken to places you thought you didn’t want to go, and finding out you were wrong. I’ve been wrong before, I’ll no doubt be wrong again – but I’d be amazed if this was one of those times. For whatever reason, colour forecasts make me retch. I want to make the course my own – interpret briefs and make selections that reflect me and my interests. I want to take risks and challenge myself. When I started drafting this post I wanted to put myself on the spot – figure out what was bothering me and find a way to make it work, to meet my goals and the course requirements. I think I could do that – say do some colour trend research then show it wasn’t relevant for my chosen product, which could be perhaps a concertina book of a journey with stickers for children to move around and all the imagery based on textile work – or something else quite different. The twist is that I won’t be doing that. 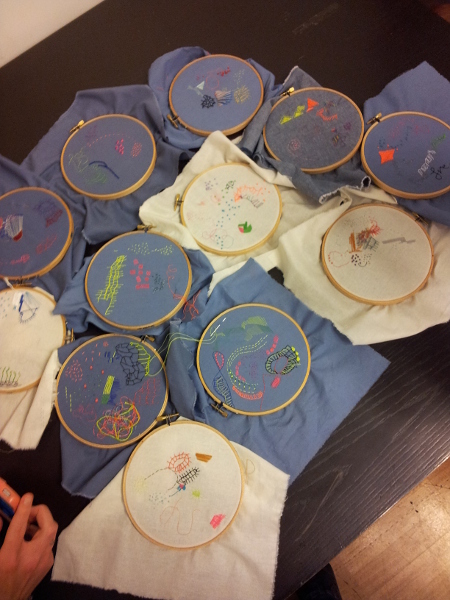 OCA has just announced a new level 1 course for textiles, and has agreed to allow me to transfer. I think it will take me even further out of my comfort zone. I suppose I’ve achieved one of my goals – I’ve totally surprised myself. Ordon, M. (2008) ” ‘I’ve got a feeling we’re not in Kansas, anymore:’ Cross-Cultural Design in Peruvian Connection’s Textiles” In Textile Society of America Symposium Proceedings. Paper 277 [online] Available from http://digitalcommons.unl.edu/tsaconf/277/ (Accessed 7-Nov-2014). Whitley, L.D. (998) “Morris De Camp Crawford and the ‘Designed in America’ Campaign, 1916 – 1922” In Textile Society of America Symposium Proceedings. Paper 215 [online] Available from http://digitalcommons.unl.edu/tsaconf/215/ (Accessed 7-Nov-2014). Stage 2 is around development – identifying interesting aspects of my source material, inserting some of my own ideas. I started, as suggested, with a brainstorm and mind map. The little sketches and changes of colour are part of trying to put myself off balance, to move away from words a bit. Three potential themes particularly attract me. 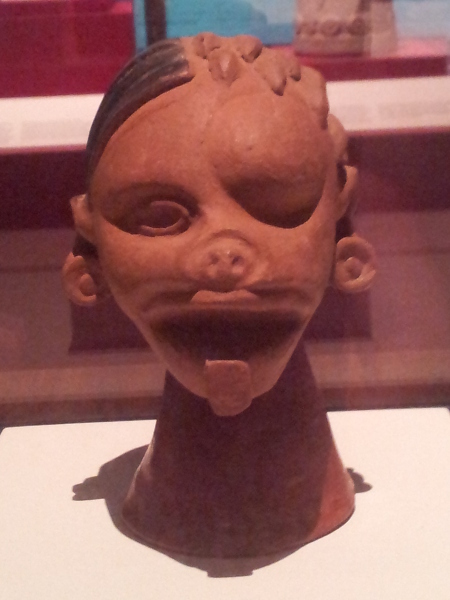 Duality was a key element in Aztec thought. This vessel shows a warrior, healthy and sick, alive and dead, possibly a victim of sacrifice. 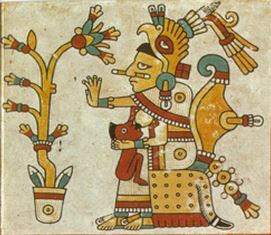 Most of the Aztec gods had both male and female forms. The bones of death were the seeds of life. There was light and dark, order and chaos, dry and wet, active and passive… They divide, complement, complete. They are parts of the same process, a cycle. I think it’s more complex than black and white – there is ambiguity. 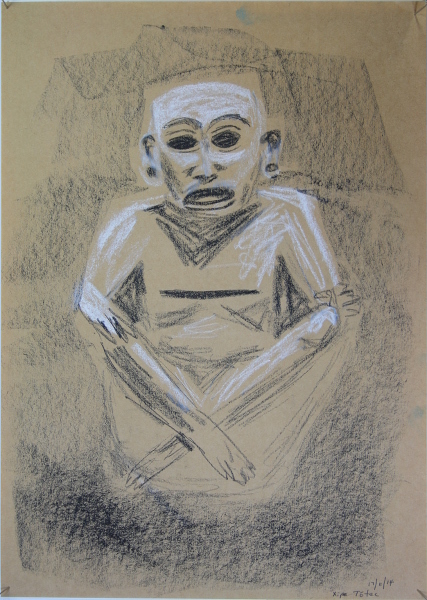 Experimentation in my sketchbook was based on a mask held at the British Museum. 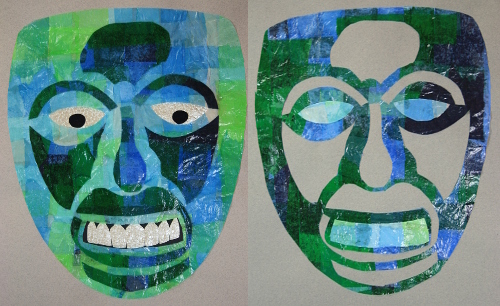 Creating one mask left remnants that suggested another – the complement. More detail is on the research page (click here). 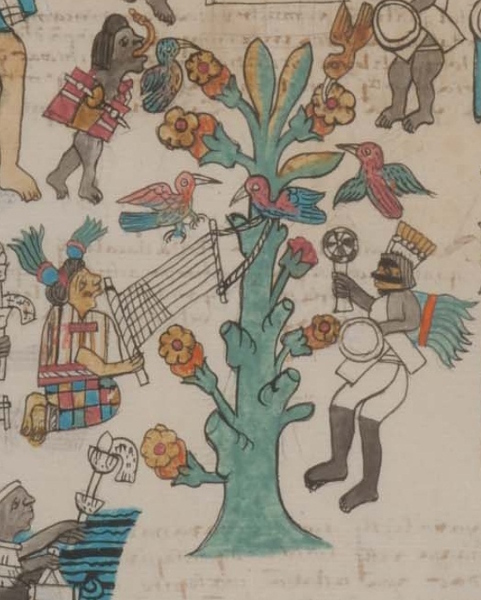 A number of the codices follow the journey of the Aztec people, including the Codex Azcatitlan. I love the symbolic elements, the presentation of movement in space and time, in the case of the Codex Azcatitlan that there is already a kind of cultural fusion in the sporadic use of western conventions such as aerial perspective. I’ve found myself thinking about what journey I could present, of formats such as a bound book or a long concertina fold (elements of connections through space, folding of time and place???). I especially like the footprints, and I know I’ve got some photographs stashed of tracks and footprints in different places. This is more a grab-bag of ideas. The emperors’ cloak (see 17-Nov-2014). This could be the textile itself, or the way we display status using clothing. Cloth as a form of currency (see 25-Nov-2014). It was so valuable, required as tribute, gifted as reward (and to confirm allegiance), requiring the industry of many women… There could be an interesting contrast to our modern culture, where clothes are cheap, fashions change, discarded clothing is shipped around the world. It could go even further into our footprint on the world – see for example Martin Medina’s 2014 article The Aztecs of Mexico: a zero waste society. However I think this idea would suit a written assignment better. 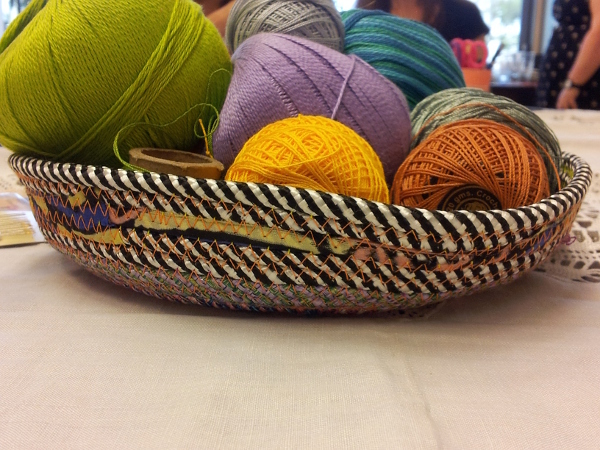 Spinning and weaving as an activity for everyone. 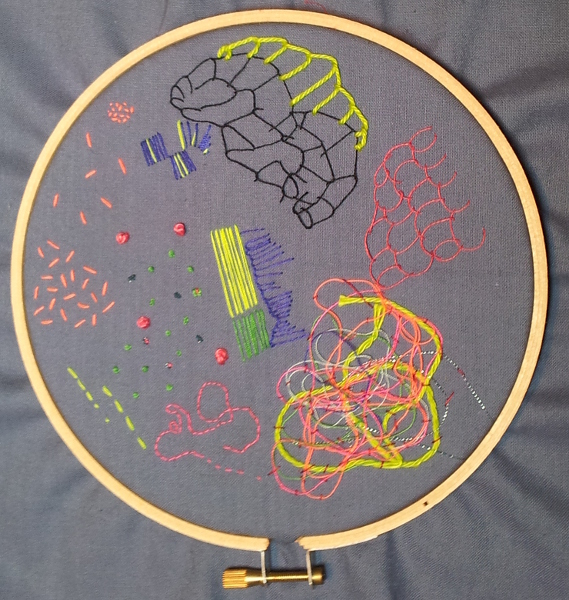 This one’s a bit fuzzy, but for a “product” I’d love to come up with some kind of kit that could bring creating textiles into anyone’s life. It doesn’t really fit the brief, but I find it wonderful to think of a society where spinners and weavers are accorded such status. The mat of power. Often a person of authority is shown sitting on a woven mat. They speak, command – others listen. Again, I haven’t thought this through, but it feels as if it could go somewhere interesting. I haven’t included any idea based on the bright colours and jazzy lines that I associate with “aztec” design. I just haven’t found them in my source material, or only in limited and muted ways which seem common to many other cultures as well. Even so, I think my next step will be to explore the fabric stash, grabbing out anything which catches my eye as having potential. I’m at the end of the time I’d allocated for this Stage. There’s more I wanted to write about, but for now I’ll finish with a visual roundup showing some art and design with Aztec influence. 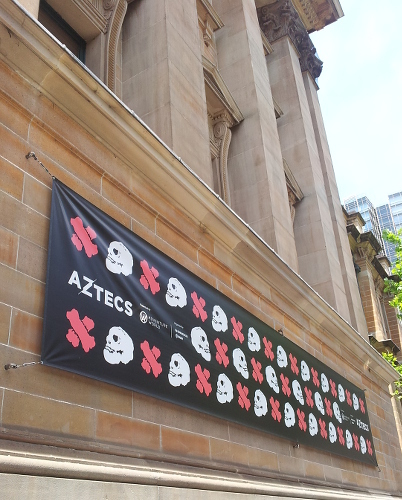 Various photographs I took at the Aztec exhibition at the Australian Museum (some photos later manipulated in the computer). Artifacts include fired clay stamps (1250 – 1521), section of a warrior brazier (fired clay, pigment, about 1500), mural fragment (wall, Teotihuacan, 200 – 900, clay, stucco, pigment), sculpture of Yapatecuchtli (1200 – 1521, fired clay), concrete wall tiles from Pyrmont incinerator Sydney (1934, designed by Walter Burley Griffin and Marion Mahony Griffin). 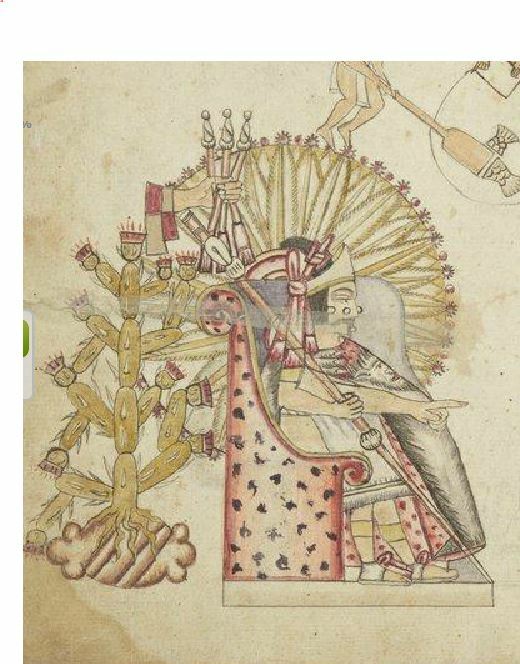 The works I have found generally link back to the Aztecs as a source of legitimacy, pride and revolutionary statement. How does one approach “cultural fusions” if the other culture had beliefs and practices that we would regard as repugnant in the present day? 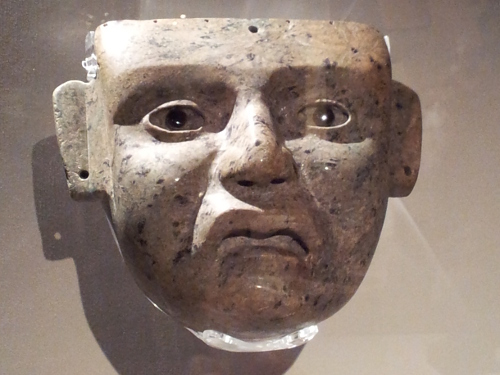 In many ways the Aztec culture was very hard. They were warriors, conquerors, who exploited other peoples, demanding huge quantities of tributes. They carried out ritual human sacrifice – of war captives, their own people, of adults and children. Apparently minor civil infractions could lead to enslavement of commoners and execution of nobles. Harshness was a part of everyday life – for example children who were lazy or disobedient could be punished by pricking with thorns, or being held in the smoke of burning chillies. One approach could be to wonder how future cultures may view my own – the situation of Australia’s indigenous people, the treatment of refugees and asylum seekers, lack of choice for the terminally ill, attitudes to the environment … and who knows what which I take for granted as normal and necessary. It could also be that some challenging aspects of Aztec culture were “played up” by the Spanish and the indigenous tribes who supported them in the conquest, as a partial justification. I’ve found it more helpful to learn a little about underlying reasons for actions. 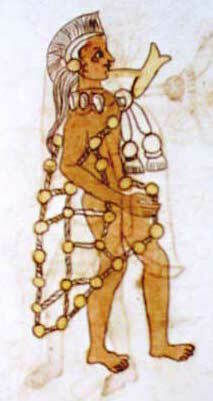 Xipe Totec, the “flayed one” was the god of spring and renewal. Each year victims were defeated in ritual battle, sacrificed, then their skins removed and worn draped over the bodies and head of priests or young men. After 20 days the priests would emerge from the rotting skin – reborn. From death came life, just as seeds come from the husk of corn and can germinate. The god was appeased, and there was hope for a good harvest. 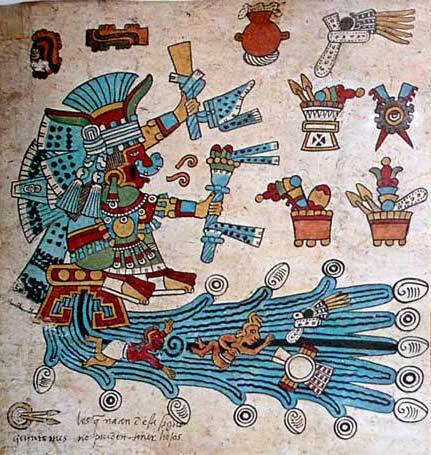 The innocent tears of children sacrificed to Tlaloc, god of rain and lightening, helped to ensure plentiful rain. Smoke rising from the burning heart of a victim could replenish the strength of the gods to fight the darkness and ensure the sun rose. Bones were the seed of new life, part of the cycle of existence. Some Aztec people would offer themselves for sacrifice, rising to dwell within the heavens, a birth into a new life like a snake shedding its skin. A warrior who died in battle would rise with the sun god each day, and eventually be reborn as a hummingbird or butterfly. I drafted the above a few days ago, probably with the main intention of acknowledging, “dealing”, with something unpleasant so I could move on to other things. Was I being gentle to myself, not taking risks, not pushing? Was I picking and choosing the “nice” bits of another culture? Some individuals would sacrifice their own blood, their own lives. Other victims were unwilling, their lives taken from them because of someone else’s beliefs, someone else’s needs. My final work for A Creative Approach was Aged Care (more at 16-Feb-2013). My topic was our torture of the elderly, and particularly “Nancy” – forced to live, trapped in a nursing home in a web of other people’s beliefs and needs. She’s still there, almost five years now, the last six months eating mush while our dental service gets around to providing new dentures. I try to visit most weeks – undoubtedly the worst hour of the week. Nancy’s treatment is no more gentle, no more merciful, no more about her the individual, no less about other people’s beliefs and customs, no less a sacrifice than what the Aztecs demanded. There may be a few fragments of actual Aztec textiles, but very few. Climate, soil and customs (for example burning of cloth in funerary rituals) have contributed to that. However there is a wealth of information available. I’ve already written about the Emperors’ cloak (17-Nov-2014). This post is a more general view. 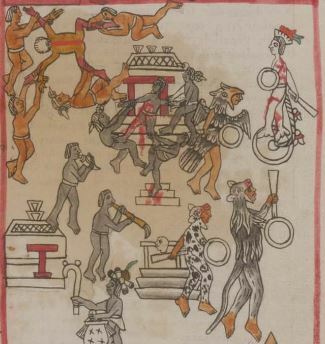 The Codex Mendoza includes pages showing the education of Aztec boys and girls. Girls were given spinning tools as infants during the naming ceremony. They were instructed in spinning from the age of 3, and spinning independently by age 6. Commoner women would use light spindles for cotton to be paid as tribute, and heavier spindles for family clothing in maguey, palm or yucca fibres. Noble women would work in cotton, possibly augmented with feathers and rabbit fur. Filled spindles were associated with fertility. Large volumes of fibre, spun yarn and woven cloth were required in regular tributes from conquered regions. The focus on teaching all girls to process, spin and weave may have been required to meet Aztec demands. Particular capes were given to warriors after specified numbers of captured prisoners – Nacazminqui textiles. Indigo was the dye suggested for the Emperors’ cloak, but cochineal was another important dye for the Aztecs. This has an Australian connection. The first white settlers are believed to have attempted to establish a cochineal industry, introducing prickly pear. Other species were introduced in the 1840s. It became a huge pest, over-running millions of hectares of farming land, with the introduction of the cactoblastis moth in the 1930s achieving a huge reduction in what remains a significant pest. In its own environment the cactus was useful, providing a home for the cochineal insect and apparently, in this illustration, a support for a backstrap loom. 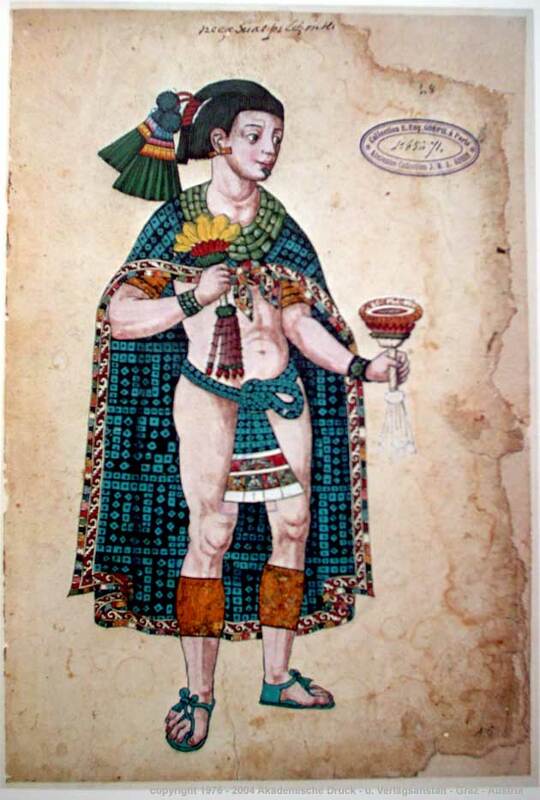 Tribes from the Oazaca highlands paid “a tribute consisting of cochineal, indigo, and finely woven textiles”. 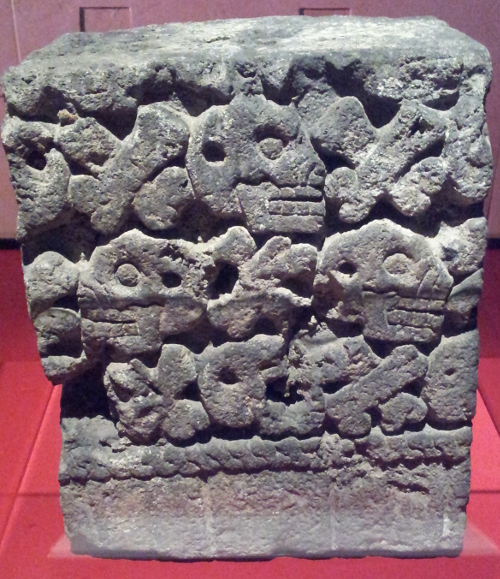 Widely traded by Aztec merchants who travelled long distances. 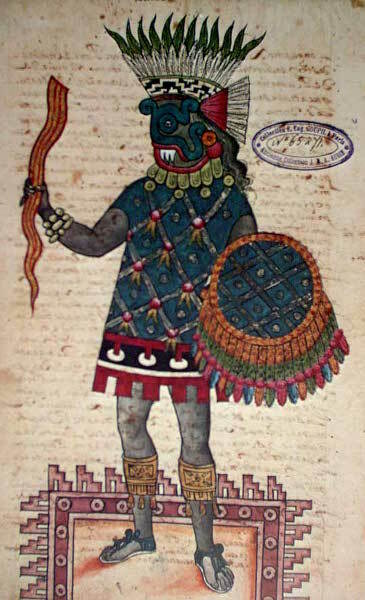 Exchanged items included “obsidian spear-points, cochineal, red ochre, rabbit-skin cloaks, and bells … bartered for quetzal plumes, jaguar and other skins, and amber”. As well as trade uses included as a dye, paint, cosmetic, medicine, and a stain for teeth. I have found a source for both cochineal and indigo, and am hoping to experiment with both – something of a step for me, as I have preferred to use the more controlled, repeatable colours of synthetic dyes in the past. I’m also attracted by the mention of bells – perhaps something sound-producing could be included in a work. With cloth so important and so valuable, fine weaving was a way for a commoner woman to gain respect and perhaps become a noble. 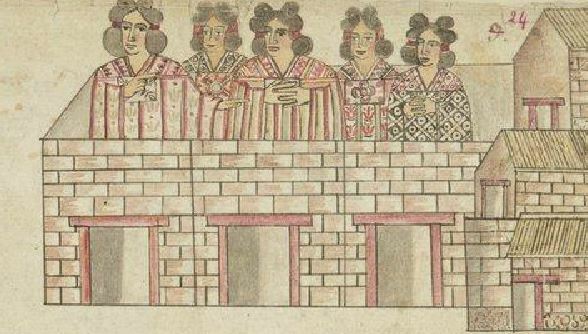 A rich or noble Aztec man could take many wives (a wife only one husband), and the wealth generated by wives’ weaving was an important part of the domestic economy. Secondary wives – perhaps “concubines” in other cultures – would receive respect as creators of valuable goods. 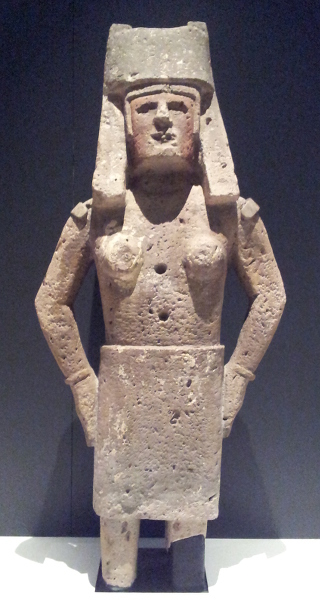 Some households had women as head, and Aztec women could take responsible positions. Little archaeological evidence of textile skills is available, with the exception of spindle whorls. Found at all Aztec sites, the numbers are disproportionately high in palaces – presumably due to high concentration of adult women. Fine textiles had value in trade and as gift exchange – diplomatic, celebration, reward – and displayed in household as evidence of status and wealth. The Spanish-imposed move to monogamous marriage had significant economic consequences. The introduction by the colonisers of higher-productivity equipment (spinning wheels, treadle looms) and factory methods also impacted textile production. Operated by men, women were isolated in the home. The market changed – new elites favoured European (style) textiles over traditional. Let go of what you “know”. Let go generally. Don’t stitch everywhere. Pick out key elements. Enjoy space. Sprinkle with seeds – good for transition areas. 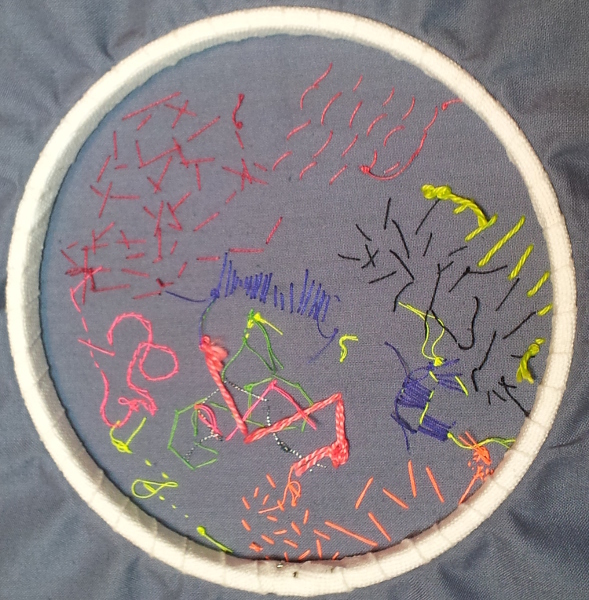 Single thread scribble – connecting. 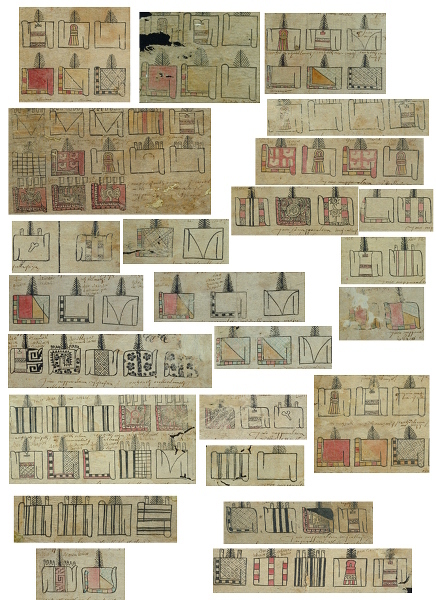 Deep in my Aztec research, the work we were doing looked a good fit for the mix of pictographs and text in the codices. Alex showed us some of her work in progress, which also included shapes cut from patterned fabrics and vliesofixed on plus lots of text. Definitely something to sample when I get to that stage of this project. Work by Tilleke Schwarz is another good reference (eg www.tillekeschwarz.com/gallery/after2000/5.html). Some fabric baskets Alex used to hold all the threads also suggest some Aztec-like design elements. If you look closely there is orange zigzag machine stitch. I’m not quite sure at the moment why I associate zig-zags with Aztec – I can’t find strong sources for it – but I definitely have the association. Much of the information available about Aztec culture is contained in pictorial codices – manuscripts containing pictographs and symbols. Although this was the system of writing used by the Aztecs, most of the codices existing today date from after the Spanish invasion, and include annotations or glosses in Spanish. Earlier documents were deliberately destroyed as part of suppressing the indigeneous culture, and in particular imposing Christianity on the local population. 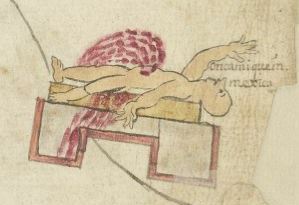 Many of the codices are available on line – in particular at http://www.famsi.org/research/graz/index.html and http://www.famsi.org/research/loubat/index.html and they are fascinating to peruse. There are dangers however. As generally happens, the history is written by the victorious, for their own purposes, and could be selective, deliberately misleading, or simply misunderstanding the indigenous people. They are also subject to multiple modern interpretations. The Toltec were venerated by the Aztec, who required that their leaders demonstrate descent from that line. Wearing a design associated with the Toltec asserted the legitimacy of Aztec authority. 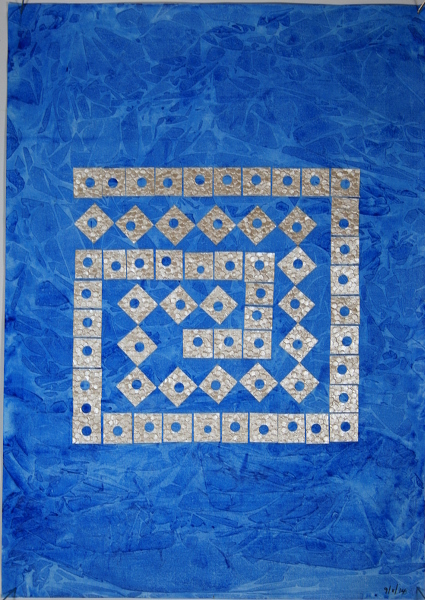 Based on the etymology of the design’s Nahuatl name, Anawalt determined that indigo dye was used, with knotting or tying resist techniques. 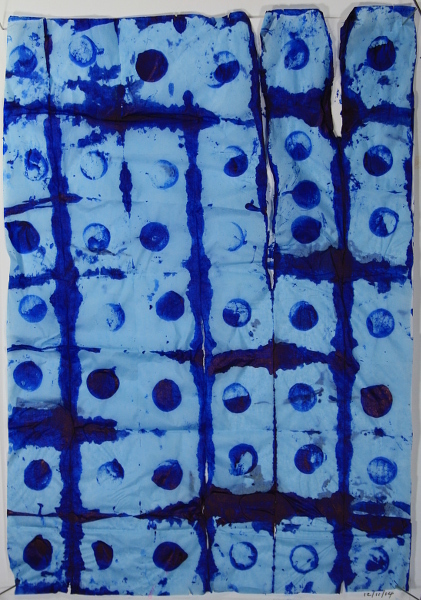 A series of experiments by master dyers suggested a combination of beeswax resist with the knotting. Additional symbolism in the design included the green blue of the indigo, a colour associated with the Toltec; the step fret layout, linking to sky/earth dualism; and a suggestion of snake or crocodile skin, and thus “Serpent Skirt” the goddess Coatlicue, in the diamond-dot pattern. Anawalt’s experiments and conclusions appear plausible – but not to Carmen Aguilera, who published an alternative view in 1997. 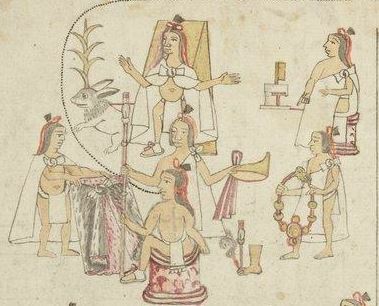 Aguilera also notes the fine textiles available to the Aztecs, including fine mantles and fabrics woven with multicoloured threads, and decorations using rabbit hair and feathers, and suggests the dyed cotton proposed by Anawalt would not fit with the status of an emperor. 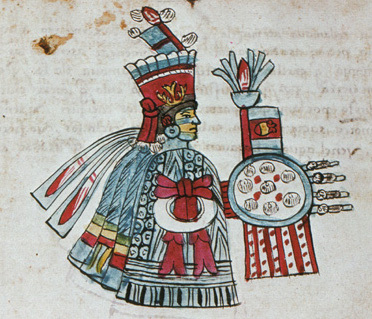 Aguilera interprets the Nahuatl name as turquoise tile mantle, and cites the 16th century description by Aernando Alvarado Tezozomoc of “the royal mantle as a netlike garment worked with stones”. Mantles and hip cloths were worn tied around the body. Aguilera cites numerous texts and images to support her suggestions. Sisal, hemp and agave rather than cotton are raised as possibilities, but Aguilera suggests maguey as the main fibre. Although often a fibre used in commoners’ clothing, it is also associated with warriors. The dotted grid seen could be interpreted as tiles or beads of turquoise pierced in the centre to allow for threading on the knotted net. Some inconsistencies in the first image could be explained as a misunderstanding by scribe or artist. There is a later paper by Anawalt in rebuttal, which I haven’t been able to access – but I don’t believe which interpretation is more correct matters for my purposes. I’m looking for inspiration, not to make a direct copy. So far the cloak has appeared a couple of times in my sketchbook work. However even more than fairly literal design interpretations, I’m interested in trying to find more personal or emotional connections. 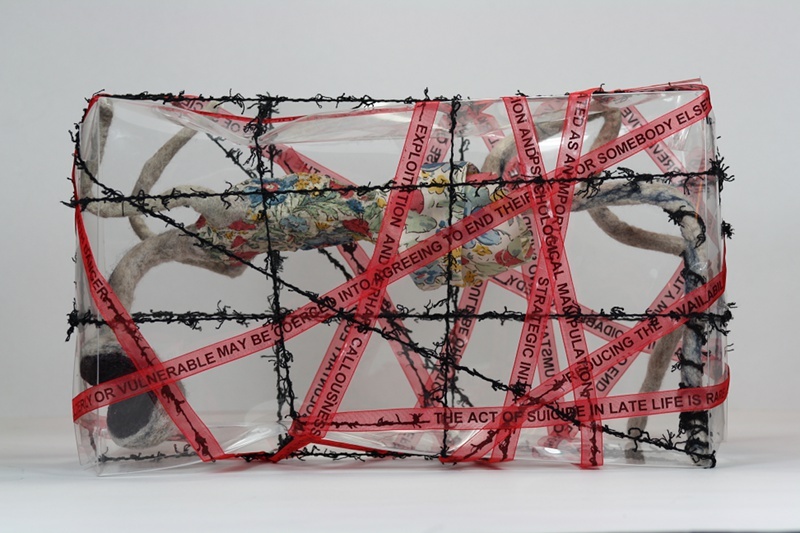 For example there are the ideas of clothing as expressing identity and status, and seeking connections in the past to understand and make sense of oneself and one’s place in the world in the present.